Remove all negative items from your credit. Don't miss a free credit repair consultation. Are you looking for Credit Repair Los Angeles service that will be able to increase your credit score ASAP? Well, you just found one! From 2014, we have been able to repair credit for over 11,000 people from Los Angeles, CA. 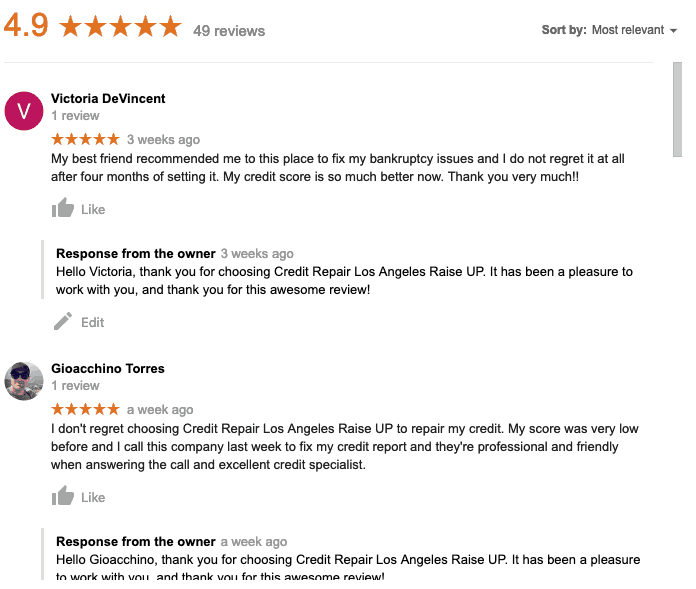 Raise Up Credit Repair is a Los Angeles Credit Repair company established in 2014. We have been named one of the best credit repair companies in Los Angeles, CA by the BBB. Let’s increase your credit score, dispute and remove the bad items so your credit score will increase again. Call us today at 657-232-3950 for a FREE credit repair consultation with our well-educated credit repair experts! Credit Repair Los Angeles have seen thousands of different cases and we are confident that we can help you too, regarding of your current credit score! Call us today (657-232-3950) for a FREE credit card consultation! You don’t want to go on a “hit and a miss” spree with your credit score. A professional repair company can do things within days that you will complete in months. They save you time and can look into things that you might not be aware of. Credit Repair Los Angeles company can help you today! Credit Repair Los Angeles Raise UP will help all of those who are looking for a credit repair company. Despite your financial expertise, credit repair is best left to a company with years of experience. One of your options, is to work with the trusted leaders in credit repair, Credit Repair Los Angeles Raise UP Firm. Credit Repair Los Angeles Raise UP will evaluate your credit reports and customize a plan that is unique to your situation. They will also communicate to creditors and all three credit bureaus on your behalf. Past customers of Credit Repair Los Angeles Raise UP have seen an average of a 40-point score improvement in the first four months of being on their service. Call us today if you need solid credit repair work. Credit Repair Los Angeles is the best company to increase your credit score ASAP!